Everybody wants to win more games, but not everybody has great pitching or power hitting. What if winning wasn’t based on that, but instead, on 7 key measurables. Use my Team Production Worksheet to see how your team stacks up with these 7 ways you can win more games. While the team with the most runs wins, there’s more that goes into winning games than simply scoring runs by having a powerful offense and a great pitcher. Let’s peel back the layers and look at some smaller things that add together to make winning more likely. Let’s take a closer look at why the winning team wins. 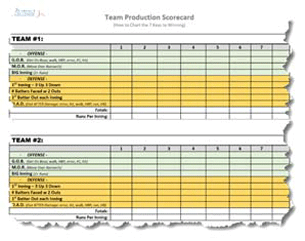 To help do that, I’ve created a Team Production Scorecard that’s ready for you to download and use today. Use this scorecard to see how your team does on these critical factors or use it while you’re watching your favorite team play on TV. This Scorecard includes the 7 critical factors that I think have the biggest impact on the final score. Factors that don’t seem flashy, or fancy or even obvious, but that are hugely influential on the outcome! Too often we get pulled into believing that our pitcher just needs to be faster to really dominate. Or we just need “better hitters” and we’d win more games. And yet NONE of the following 7 ways to win more games have anything to do with a pitcher’s speed, how fancy her pitches are, how many pitches she has or even how powerful your hitters are. The great thing about these 7 keys is that your team can focus on doing them THIS weekend, with the players you have, at whatever level you currently play! G.O.B – This means Get On Base. This is another way to track On Base Percentage, and to emphasize to your hitters to simply get themselves on base. To use this scorecard and tack your GOB, simply put a checkmark in the box for each batter that reaches base in that particular inning. There’s the obvious hit or error, but working a pitcher for a walk, forcing a fielder’s choice or crowding the plate and getting hit by a pitch all get your runners on base. And the more runners on base, the more opportunity to score! M.O.R. – Move Over Runner/s. Once you get runners on base, you’ve got to move them around to score, so moving over runners, whether that means moving them into scoring position, or scoring them once they reach 2nd becomes vitally important! The team that consistently does this the best will win more games over the course of the season. BIG Inning – Scoring more than 1 run is super important in today’s offensive-dominated game. To me, a BIG inning is 2 or more Runs. The more often you score 2+ runs per inning, the greater chance you’ll have of winning that game. This means you’ll want to hold runners at third for a chance to pile up runners and try to score multiple runs on a single. Of course, who you’re playing matters but typically you’ll take more 1 run risks later in close games, and more multiple run decisions early in games. # Batters Faced with 2 Outs – Don’t be surprised to watch a team’s wheels completely fall off with 2 outs. That means things fall apart for them, they suddenly can’t make outs on defense, runners pile up for the other team and eventually runs score. The more you can limit the number of batters that come to the plate with 2 outs, the greater chance you’ll have of limiting their BIG innings. 1st Batter Out each Inning – This is just what it says, get their first batter of each inning out, and mark down on the scorecard each time it happens. This is a team defensive goal and not simply a “strike her out” situation for the pitcher. Improving your team defense will drastically improve your chances of winning and getting the first batter out of each inning is a great first step. O.A.D. – This stands for Outs After Damage, and damage can be anything from an error to a walk to a hit to a hit batter (HBP) to a homerun. Damage is basically anything that prolongs the inning and gives the other team more chances to score. Mistakes or damage, won’t kill you. But, if your team allows damage to follow damage, and then more damage to follow that, then you’re in trouble – mentally and on the scoreboard! Winning teams get Outs After Damage. Watch for it and start to notice how winning teams really win! I know these 7 keys aren’t earth-shattering, and many of you might say, the teams that win have the best pitcher or the best hitters, and some team’s just might, but you should be looking for ways to take the players you have and beat the opponents with the players they have. Wanting to simply have “better players” isn’t something you can focus on during the game. You’ve got to make winning seem small enough to notice and seem doable. Winning sounds great, but it’s too vague. Help your pitchers get better simply by focusing on getting the 1st batter of each inning out, by limiting the batters you face with 2 outs and by getting some kind of an out after damage. Help your hitters contribute by somehow getting on base and by moving over runners. Get small, get specific and watch the wins start piling up!